Pelosi reiterates call for establishment of an independent "truth commission"
(CNN) -- The No. 2 Democrat in the House on Thursday dismissed talk of what House Speaker Nancy Pelosi knew or didn't know about the CIA's interrogation techniques. House Speaker Nancy Pelosi says she was misled about the use of "enhanced interrogation techniques." Majority Leader Steny Hoyer said that discussion "is a distraction from the central point": determining what happened during the Bush administration and making sure it never happens again. Responding to a question from Republican Rep. Eric Cantor about whether he believes the CIA may have "misled" Pelosi in briefings, Hoyer said he had "no basis (on) which to base such a belief, and I certainly hope that's not the case." "But it is a distraction from the central point," the Maryland Democrat said. "And I will tell my friend that I think there is far too much discussion about what was said as opposed to what was done." Hoyer said that a commission should look into the issue "not so much for what was done but to ensure that what we do going forward is legal, consistent with our values, consistent with our morals and consistent ... with protecting our nation and our people. In my view, we have a responsibility to do all of those." "I frankly think that upholding our values is consistent with protecting our security," he said. 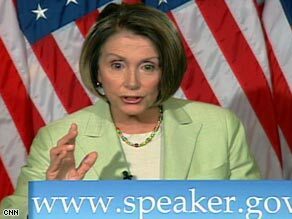 Pelosi has been under fire from critics who say that she was briefed on the "enhanced interrogation techniques," which included techniques that have been labeled torture in other arenas, including the United States at other times in its history. The California Democrat accused CIA officials Thursday of misleading her in 2002. Pelosi reiterated an earlier claim that she was briefed on such techniques only once -- in September 2002 -- and that she was told at the time that the techniques were not being used. A recently released Justice Department memo says that the CIA used waterboarding at least 83 times in August 2002 in the interrogation of Abu Zubaydah, a suspected al Qaeda leader imprisoned at U.S. facilities in Guantanamo Bay, Cuba. Pelosi said that one month later, she was told only that the Justice Department had concluded that such techniques were legal, not that they were being used. A former senior intelligence official said Thursday it is "inconceivable" that the CIA briefers would not have talked about interrogation methods that had already been used. "I can't prove it," the official said, but added, "The whole point [of the briefings] was to make sure they [lawmakers] understood what we were doing." The official asked to comment anonymously so he could speak more candidly. The official said it is important to put this all into the context of the time -- less than a year after the 9/11 attacks. "Back then, everyone was in the same boat trying to figure out what to do," the official said. "The executive branch, the Hill, DOJ [Department of Justice], the White House were trying to figure out what to do so this would not happen again." She said that in February 2003, a member of her staff told her that the Republican chairman and the new Democratic ranking member of the Intelligence Committee had been briefed on the use of enhanced interrogation techniques. Pelosi said that after that briefing, the Democratic ranking member of the committee responded by sending a letter of protest, but "no letter could change [the Bush administration's] policy." Last month, however, Pelosi told reporters that she was not told waterboarding or any other enhanced interrogation methods were being used. That was before reports came out claiming she was told by her aide about waterboarding in February. Asked why she didn't mention that before, Pelosi said, "I told you what our briefing was." "When my assistant told me that the committee had been briefed -- now, I'm not on that committee any more. I'm now out of it. We have a new -- that ranking member wrote the appropriate letter to protest that," she said at her weekly news conference. "But the committees can look into and see the timing of who knew what and when and what the nature of the briefing was. I have not been briefed as to what they were briefed on in February. I was just briefed that they were informed that some of the enhanced situations were used," she said. After Pelosi's news conference, CIA spokesman George Little said, "it is not the policy of this agency to mislead the United States Congress." House Minority Leader John Boehner said Pelosi's comments "continue to raise more questions than provide answers." "I've dealt with our intelligence professionals for the last three and a half years on an almost daily basis. And it's hard for me to imagine that anyone in our intelligence area would ever mislead a member of Congress," he said. Asked about Pelosi's allegations that Republican policy was leading the country astray, Boehner said, "I think the problem is that the speaker has had way too many stories on this issue." "When you look at the number of briefings that the speaker was in and other Democrat members of the House and Senate, it's -- it's pretty clear that they were well-aware of what these enhanced interrogation techniques were, they were well-aware that they had been used, and -- and it seems to me that they want to have it both ways. You can't have it both ways," he said. Pelosi said Thursday that Republicans are jumping on the briefings because they want to cause a distraction. She reiterated her call for the establishment of an independent "truth commission" to investigate the Bush administration's use of enhanced interrogation techniques. She also suggested that the National Security Act of 1947 needs to be revised so that more members of Congress can be briefed on sensitive intelligence matters. In 2007, Congress passed legislation banning torture and requiring interrogators to abide by the regulations of the Army Field Manual. Former President Bush vetoed the measure, but President Obama enacted similar restrictions shortly after taking office. "Throughout my career, I am proud to have worked on human rights and against torture," Pelosi said. "I unequivocally oppose the use of torture." CNN's Pam Benson, Kristi Keck and Deirdre Walsh contributed to this report.